 Ancient solar-king myths are combined with quasi-medieval monarchies in Goldstein's new fantasy (after Strange Devices of the Sun and Moon, 1993, etc.). The god Callabrion is supposed to ascend at midwinter, presage summer, and cause the days to lengthen. But, though midwinter has passed, Callabrion refuses to take his place in heaven: So the days grow still shorter and winter deepens. Gobro, the weak and ineffectual king of Etrara, is poisoned and supplanted by his sister Callia, just as the young nobleman Valdemar goes into exile. Val lodges with a beautiful librarian- -with whose help he discovers that he is the true heir to the throne of Etrara. Callia, meanwhile, declares war on neighboring Shai, but her armies are easily defeated--by treachery, force of arms, and magic. The Shai occupy Etrara, executing Callia and her retinue. Val must find allies where he can, and somehow Callabrion must be persuaded to ascend to heaven and bring summer. 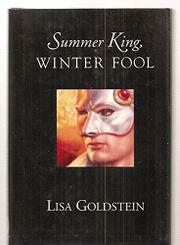 Insipid characters and feeble dramatics in a bland setting: not one of Goldstein's better outings.